The funeral was a memorable affair. Dedications from those who remembered how great a man my father was. Sadly, some who knew this more than I. Here are some things I learned. The inscription on his gravestone says: Veres Győző, Olympian, First Hungarian World Champion. Many remembered Veres Győző here in this forum as a humble and thoughtful man, which he was. But as a younger lad he was also a brilliant and fierce man who did not suffer fools gladly. 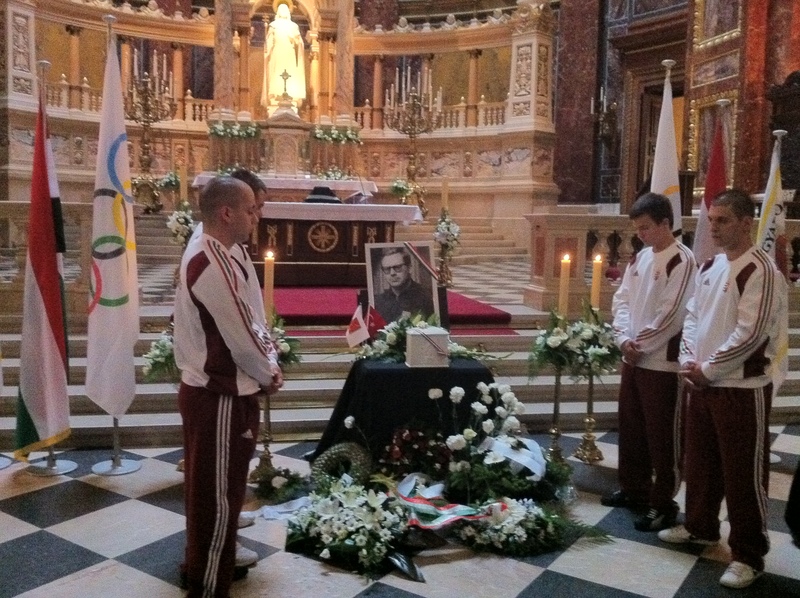 For this he was constantly at odds with the communist backed sporting establishment in his beloved Hungary. The day after his death, on February 2, one Hungarian newspaper wrote a story that ended like this: “.. with whom will he fight his battles up above, where all things are easy – I do not know”. Nemessany Arpad, his closest friend and many times world junior record holder, told me a story about an axe he used to carry under the front seat of his car. It was this axe that my father used many many years ago in communist Hungary, to hammer the gates of the police station in his birth town, in the middle of one night. You see, the house was once Győző’s family home, but because it was the biggest and most central house in the town, it was simply taken by the communists and converted into a police station. In the middle of the night one night, the newly crowned world champion decided to vent his frustration by beating down the gate with an axe! Such was his fame and influence in those times that the feared communist authorities did not disturb him. Unfortunately in the 1960’s Hungary was not entirely filled with well wishing, freedom loving people. At the head of it all stood the corrupt, totalitarian communist state. The supreme success of a single man above the control of the party was not tolerated, and soon he started battling the officials who took control from him. Veres had an iron will that could not be bought … so it must be broken, but in a way that was not too public or brutal. There was not much chance of toppling Veres Győző in the early days. In 1961 he won silver at the worlds, in ’62 an ’63 he won gold. But In ’64 disaster struck when he only took bronze. The following year in 1965 the powers that be had their chance at striking the weakened gladiator, which they did through his best friend Nemessany. The selectors decided that Nemessany was not fit to compete in the World Championships in Teheran that year. My father became enraged because he knew this was a fabrication, and he said to them that if they did not take Nemessany, then he would not go either. Of course he handed them a golden opportunity to publicly humiliate him by refusing to go. They spread rumors that he was finished as a lifter, that he was afraid to return after the ’64 failure, and so on. True to his word, Veres Győző did not go to Teheran. But he did organize a competition at home to coincide with the world championships, and he easily beat the winning result at Teheran. The following year at the 1966 world championships in East Berlin, the authorities did not take any chances. In a despicable act which was later documented in newspapers, the Hungarians paid off the judges to give Veres a red light for his world record winning lift. After the event, the gold medal winner Vladimir Belyayev reportedly stated in a newspaper article that the gold was around his neck, but the world champion was Veres Győző. Even if we are being conservative we can say that if he had simply been left to do his job, Veres Győző would be four times world champion, with 25 – 30 world records to his name. (He now has 18 – 21 depending on who is counting). But if we were in a generous mood and took my father’s own reckoning of what he could have achieved without the bitter battles, then we are counting six world and two Olympic gold medals. That would have been beyond phenomenal. But it was not to be. In the end, he was forced to leave his country, not so much because of the escalating bitterness in his own sporting career, but because of the way it was effecting his family. It was starting to become clear that the opportunities for his two sons were going to become more limited as the situation between my father and the party deteriorated, especially with his weightlifting career and legend in decline after he stopped competing in 1970. What I have come to finally realize is that my father was not like the rest of us. He achieved magnificent, unimaginable things, but he did not do these from selfish motives. At his peak, he sacrificed glory after glory for what he knew was the right thing to do. It would have been so easy for him if he was simply willing to set aside his pride and his dignity and start lying and stealing like everyone else around him. Veres Győző died in the lucky country with a thousand dollars to his name, and a bunch of medals in a plastic shopping bag. This entry was posted in Life, Personal, Travel, Veres Gyozo.